Everyone will probably need to rent a tuxedo at least a few times in their life. At Gregory’s Tuxedos we believe this should be an enjoyable event, where you will look your best. We carry a wide selection of tuxedos for rent from major brands including Calvin Klein, Perry Ellis, After Six, Claiborne, Oscar dela Renta, and Ralph Lauren Chaps. 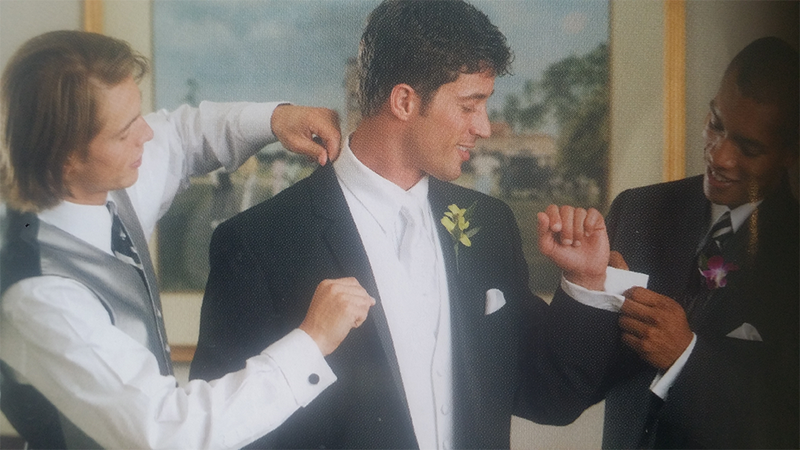 Come to Gregory’s Tuxedos for stylish and affordable tuxedo rentals in Dayton, OH. A tuxedo is the most formal outfit a man can wear. That’s why tuxedos are often reserved for special occasions. At Gregory’s Tuxedos, we’re here to help you look your best when you go to your next prom, formal, wedding or any other formal event. We have classic fits as well as slim fits, so you will definitely be able to find your style. You are sure to find a guaranteed fit in our massive inventory of high-quality tuxedos. We have classic tuxedos, tuxedos for dinner events and everything in between! Everyone will probably need to rent a tuxedo at least a few times in their life. At Gregory’s Tuxedos we believe this should be an enjoyable event, where you will look your best. And what better place to dress formally than at prom? We carry a wide selection of tuxedos for rent from major brands including Calvin Klein, Perry Ellis, After Six, Claiborne, Oscar dela Renta, and Ralph Lauren Chaps. Come to Gregory’s Tuxedos for stylish and affordable prom rentals in Dayton, OH. A tuxedo is the most formal outfit a man can wear. That’s why this kind of wear is often reserved for such a special occasion. At Gregory’s Tuxedos, we’re here to help you look your best when you go to your next prom, formal, wedding or any other formal event. We have classic fits as well as slim fits, so you will definitely be able to find your style. You are sure to find a guaranteed fit in our massive stock of high-quality tuxedo wear. We have classic rentals, from suits to tuxedos and everything in between! We have advised many clients on which tuxedos are best for them based on the occasion and we would love to help you too. Whether you need a white tuxedos or something slightly less dressy we can accommodate your needs. You don’t need to look like James Bond at every formal event, and we’re always here to offer our advice. Additionally, we offer easy returns for our clients. Call (973)293-9779 tell us what you need and when you want to pick up and try on. Dont worry about the fit, we can adjust or exchange sizes, all you have to do is TRY IT ON. Come to Gregory’s Tuxedos for your next tuxedo rental. We are the exclusive tuxedo rental shop for residents in Dayton, OH. We will help you look your best for your special occasion. Come to Gregory’s Tuxedos for your next tuxedo. We are the exclusive tux shop for residents in Dayton, OH. We will help you look your best for your special occasion.